After Radin! in 2016, Fred Cavayé (For her) is back with a comedy drama behind closed doors: The game. Bringing together Bérénice Béjo, Suzanne Clement, Stéphane De Groodt, Vincent Elbaz, Gregory Gadebois, Doria Tillier and Roschdy Zem, the director who sign there his fifth film, adapted in French Perfetti Sconosciuti (Unknown Parfaits), already adapted last year by Alex de la Iglesia (Perfectos Desconocidos). The pitch? For a dinner, couples of friends decide to play a “game”: everyone must put their mobile phone in the middle of the table and each SMS, phone call, mail, Facebook message, etc. should be shared with others. It will not be long before this “game” turns into a nightmare. 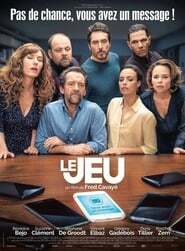 The game, directed by Fred Cavayé with Bérénice Béjo, Suzanne Clement, Stéphane De Groodt, Vincent Elbaz, Gregory Gadebois, Doria Tillier and Roschdy Zem, theatrically released on October 17, 2018.